Right now you have an awesome opportunity to own all the recipes you could ever need to keep you on the Paleo wagon for good. When you purchase the cookbook, you’ll immediately be sent the cookbook and your other bonuses. The cookbook and the bonuses are all digital downloads. These are PDF files that you can load with Adobe Acrobat onto any computer, phone, or other device. When I found out I could no longer eat grains, dairy, and all of my favorite foods that were made out of those things, I was devastated. I cried and felt sorry for myself. I thought I was the only person on the planet who couldn’t eat Oreos anymore. Do you miss your old favorite pre-Paleo comfort foods? Do those non-Paleo comfort foods keep you from staying Paleo and having the body and health you know you would have if you could JUST STAY ON THE DIET? I mean, you probably feel like crap after eating those foods, anyway – the breads, cheeses, cakes, pizzas – you know what I’m talking about. Why do we call them our favorite foods if they make us feel bad? Is This The Aftermath of Eating Your Favorite Comfort Foods? Like me, you probably feel awful after every time you eat the foods your body doesn’t like (dairy and grains, usually), and then end up regretting every second of your splurge. That’s how it was for me. 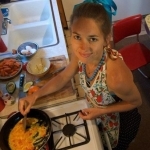 Finally, I accepted my dietary fate and decided to make lemonade out of lemons: I went on a mission to try to make my old comfort foods using only Paleo ingredients. Now, I can’t remember the last time I ate anything non-Paleo! The recipes we created literally changed my life. I no longer am even tempted by the comfort foods all over grocery stores and restaurants (and everywhere I go, for that matter). I know that I can make my own, much healthier, and often more delicious versions of those foods. And I won’t get the bloating, headaches, fatigue, and other symptoms I used to get. Moreover, I got down to the weight I’ve always wanted to be at and never gained it back, even though I’m eating these comfort foods every day! You deserve the same freedom to eat the foods that make your soul feel fantastic! 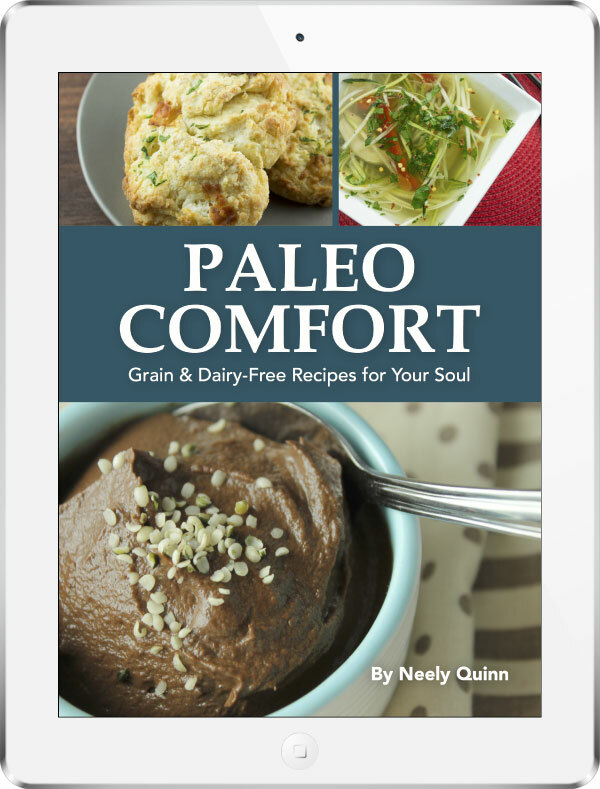 Introducing my new cookbook, Paleo Comfort! I made this cookbook so that you can feel free to eat foods that taste delicious, remind you of happy times, AND keep your health and waistline at their best. When I finally unlocked these recipes, I felt like I’d been let out of Paleo food jail, and I could finally live a normal life again. You can still eat breads, pancakes, and desserts on Paleo. Just because you’re Paleo doesn’t mean you have to be super low carb. 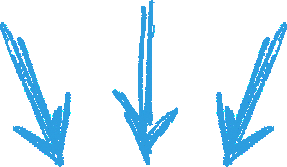 Even if you are one of those people who needs to be super low carb, I have a sneaking suspicion that you “cheat” sometimes on your old favorites, and then you probably feel sick. The whole point of the diet is to take out the inflammatory foods that are causing weight gain and symptoms – the point is to take out the foods that we didn’t evolve eating. When I stopped eating gluten, I lost 15 pounds in a month. 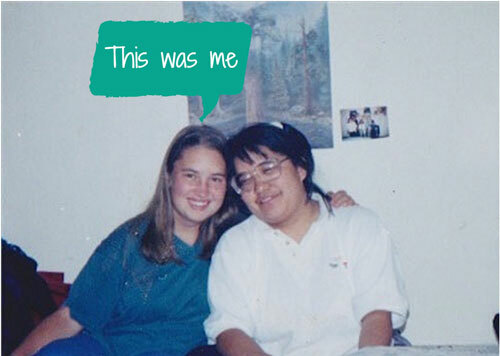 It wasn’t because I stopped eating carbs during that time – it was just that the gluten had been keeping water weight on me and making me inflamed and puffy. The same goes for other grains, dairy, soy, vegetable oils, and white sugar. Instead, you’ll be using things like coconut flour, almond flour, tapioca flour, raw honey, coconut oil, and of course, meat, eggs, veggies, fruits, nuts, and seeds in these recipes. Delicious. Hunter gatherer groups–whose health we’re trying to mimic by eating Paleo–don’t avoid sweet treats and starchy comfort foods. They just don’t make sweet treats their mainstay, which is what common sense tells us anyway. I mean, do you know what the Masaai’s favorite food is (they’re an African hunter gatherer tribe)? It’s in a study that was done on their lifestyle. They also happen to be some of the fittest, healthiest people on the planet. Along those same lines, did you know that a staple of the Kitavans’ diet is tapioca, a starchy root? 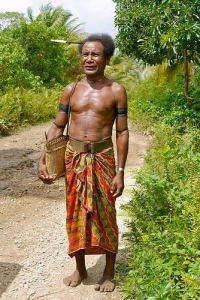 The Kitavans are a group of native hunter gatherers who live on the Trobriand Islands, and they’re extremely healthy and long-lived. Humans are well-suited to eat starches like tapioca. It’s just that we eat inflammatory starches like wheat and other grains, which make us gain weight and get sick. In this cookbook, you’ll find healthy, comforting ingredients we’ve been eating since the beginning of time, and NO inflammatory foods. I know – it’s hard to believe these recipes don’t contain refined sugar, dairy, or grains, right? It took me a long time to figure out how to do it right. You can still have all your favorite foods, even on the Paleo diet. There’s no reason to fall off the wagon and start eating the foods you KNOW will make you gain weight and feel sick. My philosophy for Paleo is this: Whatever you eat, whatever you crave, don’t feel guilty about it – just make it Paleo! I wanted to let you know that I bought the “Paleo Comfort” cookbook, and I’m so glad I did! 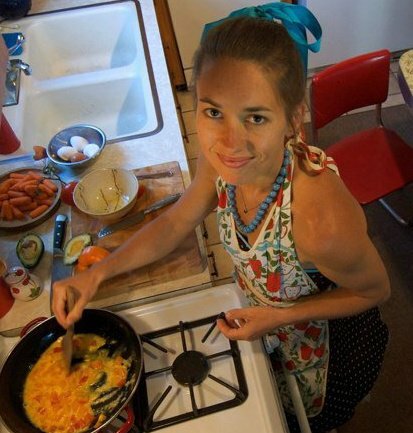 I was about to quit Paleo, even though I knew it was the healthiest diet for me. I just couldn’t deal with not having breads, pasta dishes, and desserts anymore! Now that I have this cookbook, which is beautiful by the way, I’ve been enjoying those foods regularly, and still reaping the benefits of being Paleo. I thought for sure if I had one single cookie I’d gain weight, but I really think it was just the grains and white sugar putting the weight on me! Thank you so much for this life-changing cookbook! On top of the 60+ comfort foods recipes, you’ll receive the following bonuses to make the Paleo lifestyle really stick. You’ll find out exactly what Paleo means, why you’d want to eat Paleo, and the science behind why you want to avoid all the non-Paleo foods. I went into great detail in this guide so you’d be able to have concrete answers to friends’ and family’s questions, and so you’d never have any doubt that what you’re doing is good for you. When you purchase your copy of the Paleo Comfort Cookbook, you’ll be given access to my Ten Reasons You’re Not Losing Weight guide, which lays out the most common reasons I’ve seen people stall in their weight loss, and what to do about them. 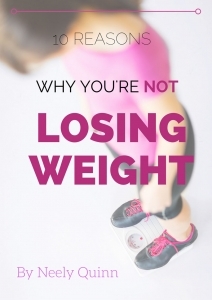 It covers what to eat, what not to eat, how often and how much to eat, and critical lifestyle factors that affect weight loss. 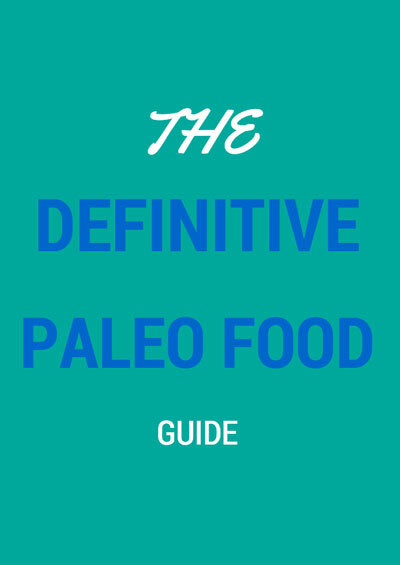 Find out exactly which foods are Paleo (and why), which are not Paleo, and all the foods in between. You’ll never be confused again about meats, dairy, sweet potatoes, potatoes, fruit, or any food again. What’s The Value of This Cookbook? Click the “Add to Cart” button below to get your copy of the cookbook! The bonuses alone are worth at least $77! This product could be sold for $94! When you purchase the cookbook, you’ll immediately be sent the cookbook and your other bonuses. NOTE: The cookbook and the bonuses are all digital downloads. These are PDF files that you can load with Adobe Acrobat onto any computer, phone, or other device. I guarantee that if you eat the recipes in this cookbook, you’ll have a more peaceful and amazing relationship with your food, and you’ll feel better and lose weight. 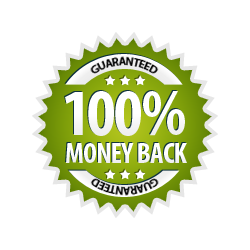 However, if you sincerely feel that the cookbook fell short in any way on delivering everything I promised, I’ll be happy to give you a complete refund up to 60 days after you purchase the cookbook – no fuss! Is this an ebook or a physical book? This is a convenient ebook in PDF format. You can download it using Adobe Acrobat onto your computer, smart phone, or any other device you own. You will not be sent a physical paperback or hardcover book. I’m working on that, but for now it’s a digital cookbook. How will I receive my cookbook? Immediately after your purchase, you’ll be taken to a page where you can directly download the PDF file. You will also receive an email containing your download. If you pay using paypal, make sure you check your email address associated with paypal. What kinds of recipes are in the cookbook? It’s funny how we don’t realize how miserable we are until we’re not miserable anymore, right? As a person who used to be sick all the time and overweight because of food, I can tell you that my life dramatically changed after I really dedicated myself to eating Paleo. I suddenly had more energy, more brain space for productive things, and more joy in my life. My mood wasn’t determined by my blood sugar swings and stomach aches caused by eating foods my body didn’t like. AND my body finally looked the way I’d always wanted it to. It was glorious – still is. You wouldn’t be reading these words right now if you didn’t truly desire to change your relationship with food. These recipes could be all you need to really stick with it. Now’s the time! By all means, if you don’t like the cookbook and you don’t feel like you got enough out of it, just let me know and I’ll refund you completely. Even up to 60 days after your purchase, just email me at neely@neelyquinn.com and I’ll quickly give you your money back. There’s really no risk to you! I hear you. Money is tight sometimes, and even $17 can mean a lot. Here’s one way to think about it if you really want to have the cookbook and just can’t rationalize it. How much food do you eat at restaurants or from convenience stores every week that you know is making you sick? How many boxes of cookies, lattes, muffins, bags of chips, ingredients for homemade brownies, [enter your favorite stress-eating foods here] do you consume weekly? I Hope You Enjoy This Cookbook! I really hope you choose to invest in your health and happiness by buying this cookbook! I really hope these recipes give you the peace of mind and comfort that they’ve given me. And remember, if you don’t like the cookbook, you can always ask for your money back, so there’s really no risk to you at all. Don’t miss out on all of this! Click the “Add to Cart” button below to get the cookbook. When you purchase the cookbook, you’ll immediately be sent PDFs that you can download using Adobe Acrobat onto your computer, smart phone, or any other device. NOTE: There will be no physical book sent to you – this is a digital product.